That delightful virus that socked me a few weeks ago proved a bit of a dilemma: G & I had tickets to the Jeff Mangum show in Athens, GA–not only a long weekend away, but also the beginning of the culmination of a dream we thought we’d never see played out (seeing Mangum play live with us in the room). Should we go down a day late, the day of the show, to give me another day to get better? Should we drive down, even though I felt like hell (no longer throwing up, at least, thankfully), so that I have the whole day on Friday to rest and feel better for the show? Is G going to stay well enough or is he going to come down with the virus while we’re there? Decision, decisions. In the end, we opted to drive down the Thursday as planned and spend an easy day on Friday exploring Athens (if I felt like it) before the show that night. Oh the show, it was amazing. Mindblowing. I wasn’t in the scene when Mangum & his band, Neutral Milk Hotel, originally recorded and toured, but I know the energy of the recordings and that same energy was still there, some 15 years down the road. The openers…well, they were terrible and one of the worst displays of self-aggrandizing “music” I’ve ever seen, but Jeff himself was mesmerizing. I feel lucky to have seen him, especially in his second hometown. I feel luckier that I’ll be seeing him again in a few short weeks in England too! But Athens, oh, Athens, I’ve missed you and your glorious mecca of food. After crawling out of bed and taking a rather painful shower, I downed a bunch of meds and we piled in the car to find Harry’s Pig Shop–a BBQ restaurant that held tales of pretty good BBQ and a selection of vegan-friendly options. See, that’s the coolest thing about Athens–it’s not Austin or Portland, Oregon, or San Fran, but it’s damn vegan friendly. While I didn’t order vegan at every restaurant, I did indulge in a fair amount of delicious vegan eats, the first of which was to be found at Harry’s. 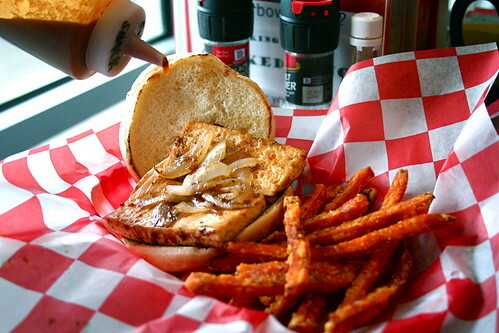 Since this was going to be only my second “real” meal–you know, something other than saltines and homemade chicken stock–I went light and ordered a simple BBQ Tofu Sandwich with Sweet Potato Fries. The tofu was coated in a dry rub and seared, served on a plain bun with caramelized onions. The dry rub on the tofu was pleasantly surprising, giving it a more authentic BBQ feel, and also giving me the pleasure of picking the BBQ sauce of my choice from the six options pictured above (my favorite was the Sweet Onion mixed with the GA Shack, btw). But the drawback of the dry rub is that it didn’t permeate into the tofu, which meant, if your bite was soaked in sauce, a pretty tasteless mouthful. The onions weren’t really caramelized either, which was a bum. Where the sandwich lacked, however, the sweet potato fries shone. Holy crispy delicious fries, I could eat you every day! I can’t give the sandwich a glowing review, but overall I found it tasty, and it hit the spot for a famished but queasy stomach. G ordered the Sampler BBQ Plate which gave him the option of trying the pulled pork, chicken, and brisket all on one plate. I tried nibbles of each and, by far, the pulled pork was my favorite–tender and juicy and perfect for saucing up. The chicken pulled in a close second given how succulent it was (nothing worse than overcooked chicken), but the brisket didn’t do it for me. It was a little too tough and dried out–something no amount of sauce can help. For a side he ordered the baked beans which were great, other than the tiny amount served. But there was plenty of meat for not only lunch, but also for 3 more lunches back home, so, price-point, it was a steal. After eating, we wandered around the old section of UGA’s campus, basking in the warm sunlight and admiring the architecture. I’m glad I went to Emory, but I often wonder if I shouldn’t have given UGA more of a chance. The further removed I am from my 18 year old self, the more I think about how my decision process for college wasn’t necessarily the brightest. And now, looking at this picture, I can’t believe how much weight I lost while sick–nothing like not eating for three days, eh? Thankfully I’ve put back on my healthy weight by now!! Thankfully the food hasn’t changed and my spinach & mushroom pie was divine–with a poofy, chewy, soft, black and crusty bottomed crust that makes me dream of pizza. What I’d do for a pie like that in Roanoke (hey, Roanoke is crazy family-friendly…why can’t we have the chain here, yo??). 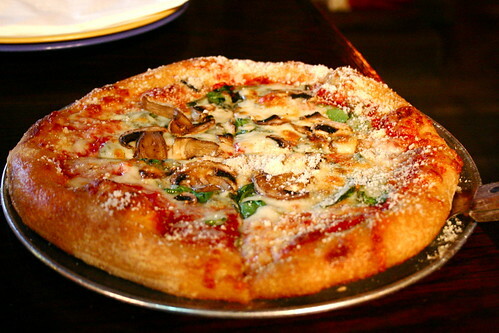 The few changes that have occurred food-wise are pretty awesome actually–G was able to order a gluten-free crust! And, if I’d felt like it, I could have ordered a vegan pie with Daiya cheese. How cool is that? The gluten-free crust wasn’t anything to write home about, but it wasn’t the worst either. 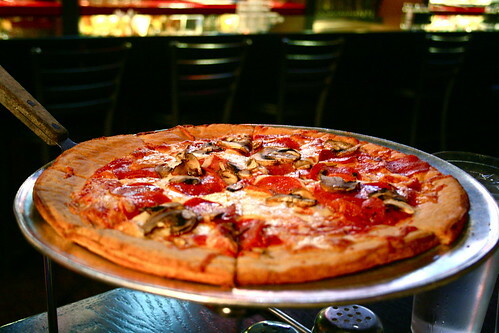 And when both of us can enjoy an awesome pizza, what more is there to love? The next morning, after waking up with Jeff still singing in my dreams, we drove around in search of brunch with great hopes to eat at Mama’s Boy. Oh boy, that did not happen. Hello hour long line stretching out into the windy-gray-nasty-all-of-a-sudden-cold day. In our driving, though, we passed Taqueria del Sol, a restaurant I never knew had expanded to Athens and which happens to be one of my favorite slightly gringoed taquerias in Atlanta. Must eat now. For reals. So we did, thankfully, because, by that point, we were starving and I had visions of fried chicken tacos and queso dancing in my head. You can’t stop a good thing. 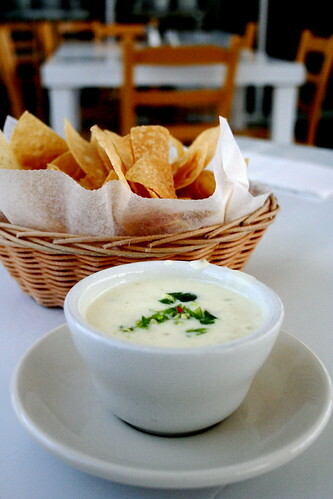 See that cheese dip, pictured above? Yup, that stuff is addicting. Cheesey with hints of jalapenos, served with fresh, crunchy chips–it might be gringo, but I don’t care. I could eat it every day. (I guess it’s a good thing I no longer live in Atlanta, eh?) The format of Taqueria del Sol is something I love dearly too–you stand in line (a line that often stretches out the door), order at the register, sit, and then the food comes. And it’s cheap–we ate lunch for under $15. The menu is small–tacos, a special or two, some enchilada options, and some sides–and it’s always executed the same. It’s heaven in my mouth. And speaking of my mouth, I definitely ordered “my order”–one fried chicken taco & one fish taco. 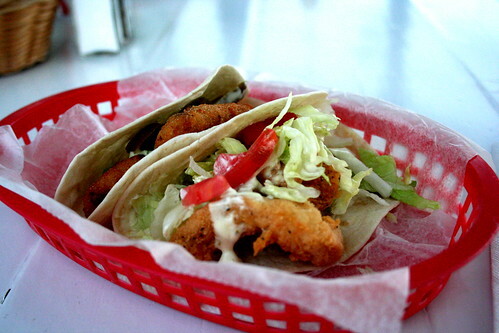 The fried chicken tacos features perfectly fried chicken breast with a jalapeno mayo, lettuce, and tomato. Don’t let the “jalapeno mayo” fool you–it’s heavy on the jalapenos, not as much on the mayo. Which means a nice, spicy bite with the tender fried chicken. As for the fish, you get corn fried tilapia served with pickled jalapenos and a tartar sauce spiked with poblanos. I don’t think I’ve ever ordered differently in the 10 or so years (minus the vegan years, of course) I’ve been eating at the location in Decatur. You can’t beat it. G ordered the a brisket taco and a carnitas taco–more traditional takes on the kinds of tacos you’ll order from a hole-in-the-wall taqueria or food truck. 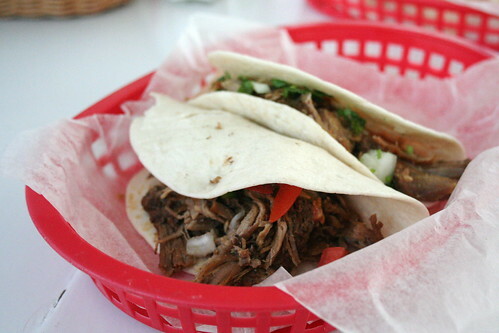 The carnitas were cooked perfectly, nice and tender and juicy, and served with salsa frita, cilantro & onions. The brisket was also extremely tender and featured a pico de gallo on top. 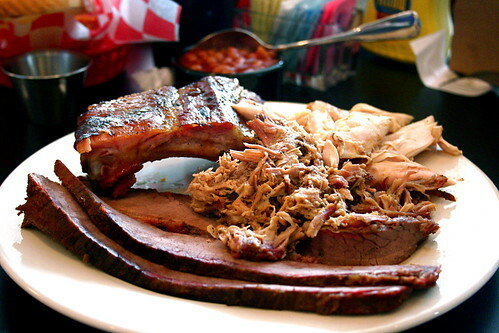 If pork and beef are your thing, you can’t go wrong with them. I’m a die hard fish & chicken taco combination at Taqueria del Sol, but these tacos shine in their own delicious way. A few hours later, and feeling much much much better, we decided to grab a mid-afternoon drink and snack at one of the pubs I’d scoped out. Visiting bars in Athens while in college is completely different than my experience this time. And I fell in love with Trapeze, a delightful beer-centric pub with a ridiculous number of taps, some amazing frites, and friendly, knowledgeable barkeeps. 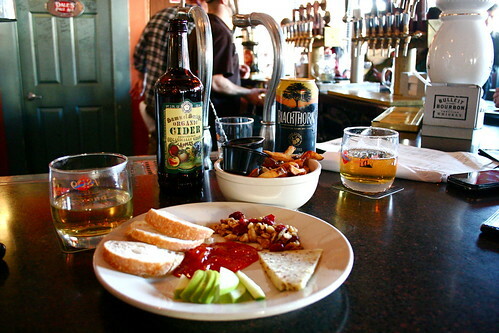 Swayed by the prospect of Samuel Smith’s Cider, my favorite cider in the world which I cannot find in Roanoke (except occasionally, for an outrageous price), I didn’t order a drink from the taps, but instead stared at the lovingly while we noshed on rosemary & garlic fries and a cheese plate featuring Red Dragon Cheddar. Sunlight filtering in through the big windows, the warmth of a pub, crisp cider & tangy cheddar, fries smothered in garlic chunks, and a good mix of low-key indie music playing, I couldn’t ask for a more peaceful spot. Some people like yoga, meditation, silence–this is the kind of place I can reconnect with myself. After that lovely break, we met up with my good friend K who drove up from Atlanta to spend the evening with us. We grabbed a pre-dinner drink at Manhattan Cafe, a quirky bar we’d visited the night before that I fell in love with (picture a more bohemian dive-ish bar filled with comfy antique couches, lamps made out of baby doll heads, warm boozy drinks, etc. ), and then dinner at Gymnopedie, a vegetarian place I’m going to write in-depth about next. 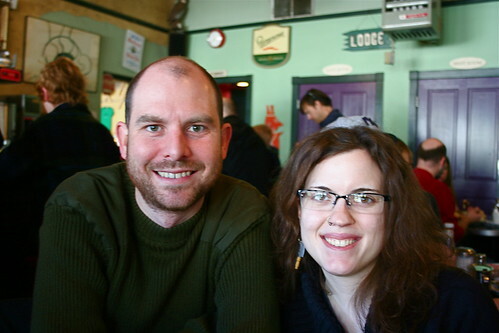 The next morning, after sampling more brews at Trapeze, we caught brunch at the historical The Grit before G & I headed back to Virginia. The Grit opened in 1986 during the heyday of Athens. It’s all vegetarian, all delicious, and, hands down, the biggest breakfast I’ve ever attempted to eat. That breakfast burrito could have eaten me. And two biscuits on top of it?! It lasted for two more breakfasts after I got home. I opted for eggs instead of scrambled tofu, though I could have gone that route, and ordered the potatoes as a side. 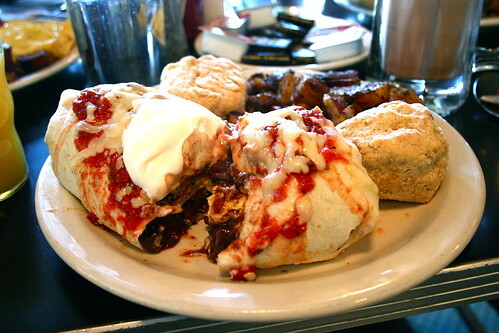 Starchy, filling, and maybe a little too bean-filled, the burrito hit the spot and kept me full for hours on the road. The Grit might not be the fanciest of places, but it’s a great spot to grab some solidly delicious vegan and vegetarian food, be it breakfast, brunch, or dinner. I’ve always loved it as a comfort food spot and this trip satisfied my craving. Harry’s Pig Shop just sounds like an outright win! Lol. I’m glad you are getting back to a healthy weight and also glad you are not strictly vegan. Too much good non-vegan food to pass up. And those sweet potato fries look so good! Ahh! I live in Athens and I was at the Friday Jeff Mangum show. I agree with you about the opening band, but they also weren’t actually a band. Laura is in various bands and was in NMH, one guy was from Elf Power, and I don’t know the other guy — the one with the beard — whose songs I really didn’t enjoy. Look up Orange Twin — it’s a record label and a farm, and it’s fantastic. 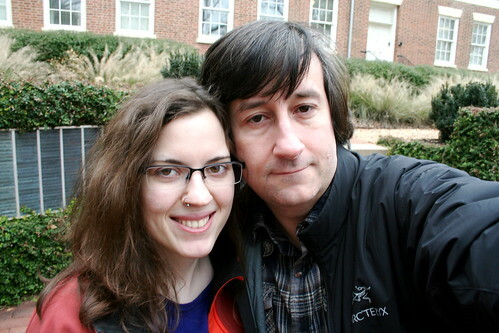 My partner is from Athens and went to UGA, and now we’re both in grad school at UGA. I don’t know what you were looking for out of undergrad (I mostly needed to get out of Florida), but I’m really glad I went to Emory. Athens has an incredible queer/radical/punk/progressive community, but I think it can be hard to connect to from inside the university. I think Emory gave me a community and the room to come into my own, and I really needed that when I was 18. How awesome that you got to see Jeff mangum….I had friends who saw him up here in NY and were also really blown away. 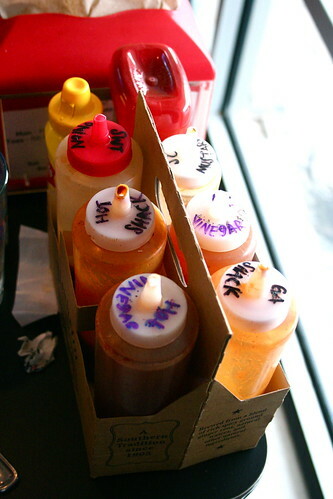 It’s nice to see some tofu available at a BBQ place – as well as some fries done right. The photo of you and G is great!